Hootsuite is a great tool I recently discover. This tool help to update your twitter account from your browser. I really like this service because I can add any website to my twitter update. I generally add my websites and new content to update everyone. My twitter feeds into facebook always creating updated information. HootSuite creates another platform to have multiple tweets to your content and allow others to re-tweet your info. For monetizing, Hootsuite links right back to whatever website you "hootlet" to. In this case, I "hootlet" back to content produced on anyone of my websites. Hootsuite also create shorten url to post under the 140 characters required by twitter. This service is a better Digg and offer total control over what is sent out on your twitter account. If you operate multiple accounts, Hootsuite allow control of all your accounts under one setup. 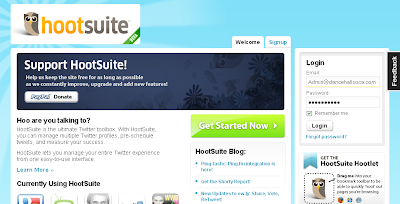 I know many people have been talking about twitter but I think other services like hootsuite add value to twitter.